It’s live!! Click the images to visit! Following the success of the Revit Technology Conference series in Australasia and North America, industry demand has once again led to us to cross continents! 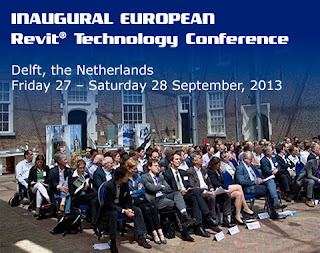 We are very excited to announce that the inaugural European Revit Technology Conference will be held in Delft, the Netherlands on 27 – 28, September 2013. The conference will be presented in English and will showcase a selection of our premier speakers from the Australasia and North America events as well as industry heavyweights within the European market.